Déjà Vu Flooding In Paris As Officials Say Seine Will Crest Soon : The Two-Way The river is expected to peak at around 19 1/2 feet later this weekend, but not before it swallowed up streets, halted all boat traffic and sent rats scurrying through the city. The river Seine in Paris had already overrun its banks by Saturday, and fears remain that it could creep across more of the city. 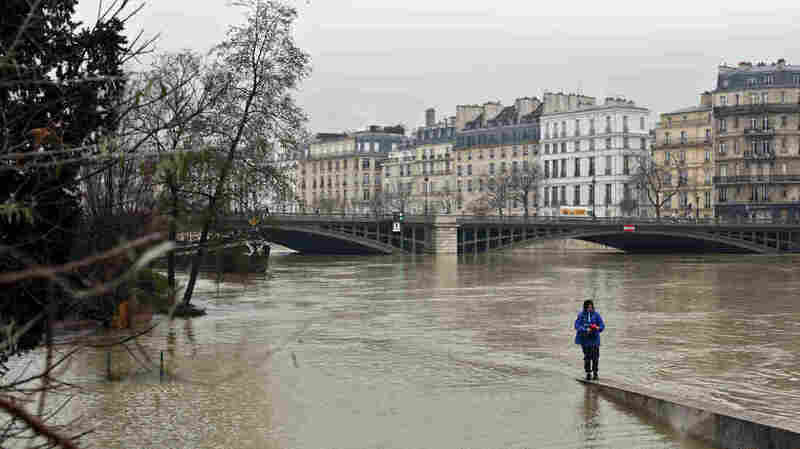 Still police in Paris were able to deliver a bit of bright news Saturday, saying river levels were expected to peak at 5.95 meters — or 19 1/2 feet — Sunday night into Monday. That was just shy of the feared 6 meters predicted earlier in the week. The river's normal level is only about 2 meters, or 6 1/2 feet, reports The Washington Post. The swollen Seine has already shuttered subway stations and the Louvre's lower-level museum display; halted all river traffic, including Paris's famed tourist boat rides; and sent swans a-swimming on what would normally be dry ground. Paris has been at the maximum orange flood alert level since Tuesday. And in the city's environs, flooding has forced 1,000 people from their homes, according to police. "There's a busy road that goes along the Seine," reports NPR's Eleanor Beardsley. "It is gone. You can only see the tops of some of the traffic signs." And Parisians have been advised to remove valuables from their basements, wine cellars included, to protect against a rising water table. Even as the levels are expected to go down, it could be a slow slog. "Floodwaters take several weeks to recede as lakes and reservoirs are full," says Eleanor. Another unsavory element to the flooding: a reported rat inundation. High waters were said to have sent the rodents scrambling across city streets. It is not just France's capital city that is waterlogged. 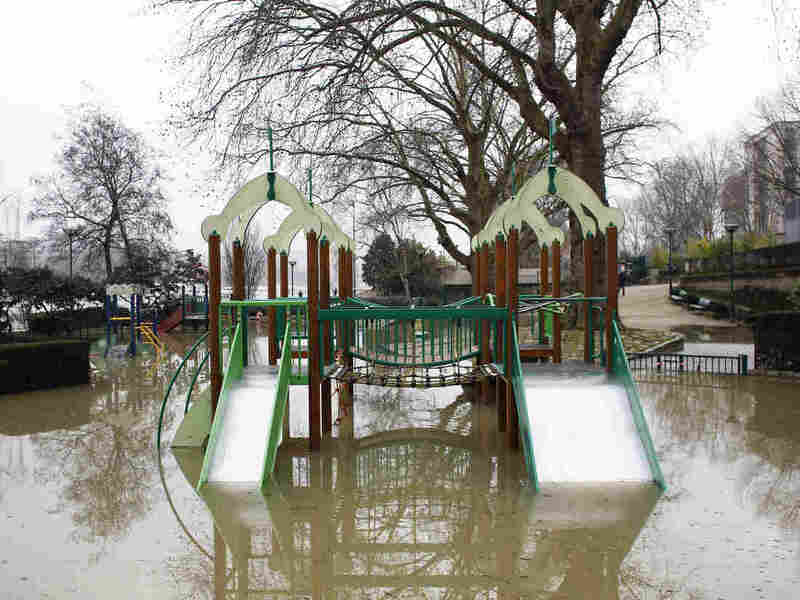 The national weather service, Météo-France, says the country has experienced exceptional rainfall this winter, making it the wettest in decades. Downstream of Paris, in the northwest of the country, the situation is even bleaker where "flooding is greater than in 2016," police said, with levels not seen since 1982. In 2016, it was wet across the Western Front. Flooding in France, Germany and Belgium killed around a dozen people. And in Paris, the Seine reached 20 feet that June, the highest level seen in decades. Experts tell The New York Times that climate change may mean frequent flooding is the nouveau normal for Paris. "Because of climate change, we can expect floods in the Seine basin to be at least as frequent as they are right now," Florence Habets, a senior researcher at the France's national center for scientific research, told the newspaper. "No matter what we say, the more we reduce our greenhouse gas emissions, the more we reduce our impact on droughts and floods." Paris' worst flooding on record occurred during 1910, when the Seine rose higher than 26 feet. Today's Parisians are taking the current flooding largely in stride. Parisian Pierre de Potestat told Eleanor that despite the damage, he can appreciate the beauty. "I like the seagulls, you know. When the river gets bigger, maybe more seagulls come from the sea," he said.